Where is the vestibular system? The vestibular system is comprised of several structures and tracts, but the main components of the system are found in the inner ear in a system of interconnected compartments called the vestibular labyrinth. The vestibular labyrinth is made up of the semicircular canals and the otolith organs (all discussed below), and contains receptors for vestibular sensations. These receptors send vestibular information via the vestibulocochlear nerve to the cerebellum and to nuclei in the brainstem called the vestibular nuclei. The vestibular nuclei then pass the information on to a variety of targets, ranging from the muscles of the eye to the cerebral cortex. What is the vestibular system and what does it do? The vestibular system is a sensory system that is responsible for providing our brain with information about motion, head position, and spatial orientation; it also is involved with motor functions that allow us to keep our balance, stabilize our head and body during movement, and maintain posture. Thus, the vestibular system is essential for normal movement and equilibrium. 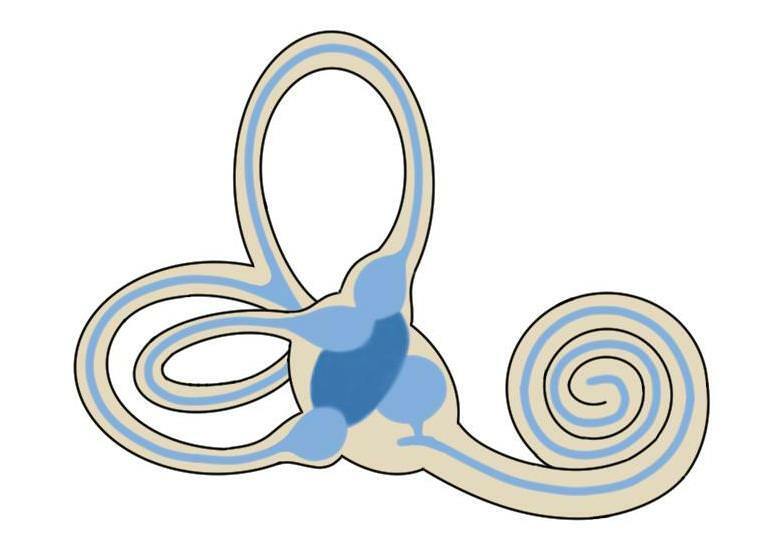 Vestibular sensations begin in the inner ear in the vestibular labyrinth, a series of interconnected chambers that are continuous with the cochlea. The most recognizable components of the vestibular labyrinth are the semicircular canals. These consist of three tubes, positioned approximately at right angles to one another, that are each situated in a plane in which the head can rotate. This design allows each of the canals to detect one of the following head movements: nodding up and down, shaking side to side, or tilting left and right. These movements of the head around an axis are referred to as rotational acceleration, and can be contrasted with linear acceleration, which involves movement forward or backward. The semicircular canals are filled with a fluid called endolymph, which is similar in composition to the intracellular fluid found within neurons. When the head is rotated, it causes the movement of endolymph through the canal that corresponds to the plane of the movement. The endolymph in that semicircular canal flows into an expansion of the canal called the ampulla. Within the ampulla is a sensory organ called the crista ampullaris that contains hair cells, the sensory receptors of the vestibular system. Hair cells get their name because there is a collection of small "hairs" called stereocilia extending from the top of each cell. Hair cell stereocilia have fine fibers, known as tip links, that run between their tips; tip links are also attached to ion channels. When the stereocilia of hair cells are moved, the tip links pull associated ion channels open for a fraction of a millisecond. This is long enough to allow ions to rush through the ion channels to cause depolarization of the hair cells. Depolarization of hair cells leads to a release of neurotransmitters and the stimulation of the vestibulocochlear nerve. The hair cells associated with the semicircular canals extend out of the crista ampullaris into a gelatinous substance called the cupula, which separates hair cells from the endolymph. When the endolymph flows into the ampulla, however, it causes the distortion of the cupula, which leads to movement of hair cells. This prompts stimulation of the vestibulocochlear nerve, which transmits the information about head movement to the vestibular nuclei in the brainstem as well as to the cerebellum. The vestibular system uses two other organs, known as the otolith organs, to detect linear acceleration, gravitational forces, and tilting movements. There are two otolith organs in the vestibular labyrinth: the utricle and the saccule. The utricle is specialized to detect movement in the horizontal plane, while the saccule detects movement in the vertical plane. The process of sensation in the otolith organs bears some similarity to the process in the semicircular canals, but there are also some distinct differences. Like the semicircular canals, the otolith organs also contain a sensory organ where hair cells can be found; in this case, however, it is called the macula. As in the semicircular canals, there is a gelatinous layer above the hair cells; in the otolith organs, however, there is another fibrous structure called the otolithic membrane above the gelatinous layer. The otolithic membrane has small crystals of calcium carbonate called otoconia embedded within it. These crystals make the otolithic membrane heavier than the rest of the structure; when linear acceleration occurs, it causes the otolithic membrane to shift relative to the macula, which leads to the displacement of hair cells and thus the release of neurotransmitters from these cells. The structure of the otolith organs makes them especially sensitive to movements like linear acceleration and head tilts. The vestibular system uses this information about movement obtained via the semicircular canals and otolith organs to maintain balance, stability, and posture; one way it does this is through its involvement in reflex actions. For example, the vestibulo-ocular reflex (VOR) is a mechanism involving connections between the vestibular system and the muscles of the eyes that allows our gaze to remain fixed on a particular point even when we move our heads. Disruption of the vestibular system, whether due to some inherent pathology or to a transient state like alcohol intoxication, can involve symptoms like vertigo, loss of balance, and nausea and can range in severity from mild to incapacitating.